The real fact is that LinkedIn has nearly 225 million professionals where every professional post jobs and works on new hires. Every HR or recruiter would surely mention you to network or use social media for job hunt or for the sake of recruitment. Author Wayne Breitbarth mentions that many people do not use the professional network LinkedIn as they do not know to use it for job hunt purpose. To check the response of job search and recruitment on LinkedIn a recent search for the term “mechanical engineer” turned up 68,400 responses, the main fact was that there were nearly 347 active engineering jobs under which 2183 were recruiting mechanical engineers. 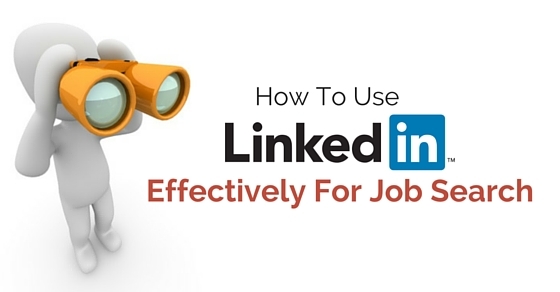 Hence LinkedIn is a powerful tool as it helps in a job search as well as recruitment. The following mentioned are few LinkedIn tips on how to find jobs using LinkedIn for job search. LinkedIn has many features which are used for job search which many people are unaware of. The LinkedIn page has jobs tab which can be clicked and used for a basic or advanced job search. The candidate can enter the location, keywords and postal code and click on search for a job hunt. Advanced job search may lead you to job search options which are self-explanatory and standard. You can target on particular companies, title, location, job function and more. To know more about LinkedIn Job search, candidates need to go more into LinkedIn. Suppose you’re looking for an accountant job in New Jersey then the candidate needs to enter the same criteria and click on LinkedIn search. This will lead you to LinkedIn jobs, and here LinkedIn jobs are ones which are paid and posted on LinkedIn. The main aspect of LinkedIn jobs is that you can have a look at the LinkedIn job posting who post the job. You have a column called posted by where you can see if the person posted is linked to you or not. Once you have reached and got to know the person who posted the job, by clicking on the person’s name you can get to know a number of things. You can get to know if any of your contacts are linked to the job poster if someone from your network is linked to the job poster you can ask for a referral; the connections the company has posted can also be checked. In the same manner, the people in the company can also be requested for an introduction. These are some few important but great features for the job hunt in LinkedIn. During the job search as mentioned above, when you click on the web non-LinkedIn jobs are listed. By clicking on the web, abundant internet jobs are posted. Once you click on the web, jobs that suit your criteria are listed which are on simply hired. This is another vertical search engine which is similar to indeed. This will fetch you many jobs possible depending upon your criteria. The job insiders is another beneficial feature which helps you find out if you’re connected with any organization posting jobs. With job insiders, ones who work for the current company you searched are listed. If these people aren’t in your network you can just see the title and not the name. Candidates should bear in mind that recruiters pick the best candidates by making use of talent finder search options. All LinkedIn network members are contacted by recruiters by making use of talent finder which has features such as in mail, get to know more expanded profiles, gain more results and filters and also recruiters find candidates who are seeking for a job actively. When you’re in the process of job search you must have a set of companies on your target list. For candidates who do not possess such a list, it is mandatory to create one such list. Candidates should be aware of following them by means of their company pages. By this way, anything new that happens in a company can be known once you are in touch. There may be a new branch opening or the latest product release, all these can be easily found out. Getting to know about the target company is important for job search. You may have many contacts in your LinkedIn profile where your first degree connection may know someone with whom you like to get linked. In such cases, you can request your first degree to introduce you to that particular employer or person. For this, the target person’s LinkedIn profile can be browsed where you can find a blue link which says “send a message”. In the same manner, the right side of the link also has a pull-down menu which had “get an introduction” to know if both of you have someone in common. This can be a useful tip for job search. LinkedIn can be used for a job search in an effective way, where the candidate needs to know the hiring manager in an organization who is targeted. It is quite easy to get to know the hiring managers in an organization but a bit complicated in many bureaucratic and enormous organizations. Candidates can make sure to use the advanced search feature on LinkedIn to find the hiring manager in the target company. For this, the target company name must be filled in the most likely title and second search term as a hiring manager. This can be an effective feature for job search. Candidates who desire to get in for a job search or wanted to be recruited should know that LinkedIn is the best source. Candidates should participate in groups and post status updates and organizations also do the same and watch out and reach the network. Employers source candidates through this manner, so candidates should make sure to regularly interact and participate in groups in order to get recruited. Being an active participant you can get noticed and have more chances to be recruited. Employers participate in groups to establish their organization and themselves on LinkedIn. Recruiters make use of the question and answer section where they establish a relationship with experts and also fill their positions. Networks are invited by posting questions which are specific to the department with regular openings and networks. And hence candidates should be active in many networks which can be beneficial for a job search. The advanced people search function is the one which is used to find people within required geographic location who possess required skills, experience, and knowledge. Hunt for the job descriptions similar to the ones you search for, make sure you use keywords accordingly for skills, experiences and descriptions. Apart from this, the main aspect is to sprinkle the keywords throughout the branding statement and profile summary instead of having it as a block of keywords. LinkedIn recruitment is purely effective with the help of Talent Brand Index into the scene. The main use of Talent brand index is that it measures and also helps you know the number of people who are engaged in. About 94% of the recruiters who make use of social networks make use of LinkedIn. The details mentioned below prove that LinkedIn is the main source for recruitment. JobVite survey proves that LinkedIn is dominant in the main uses. Candidates are hunted through LinkedIn by 95% of the recruiters, 95% of candidates are contacted through LinkedIn, to ‘keep tabs’ on candidates 93% of them use LinkedIn, to ‘vet candidates for pre-interview’ 93% recruiters use LinkedIn, jobs are posted on LinkedIn by 92 % of recruiters. And hence LinkedIn is an important source for a job hunt. Another important tool which is used for job hunting is the alumni search. To use the feature get to contacts, slide down to schools and you can get details of all the students who are from your school and details about where they work now can also be found. Getting connected to the alumni is another best way to network and expand your connection. You can discover new job opportunities when you get in contact with a large number of groups and contacts. LinkedIn is the only effective tool which can be used for job hunt as well as for recruitment purpose. The above mentioned are few pointers on using LinkedIn for job search which is beneficial for job questers and recruiters to get their desired ones. There are ample features which help you get associated with the employer. Candidates should understand and use the various features available in LinkedIn in order to stand out of the rest. New opportunities can be discovered and jobs as per the candidate’s requirement can be obtained by making proper use of LinkedIn. Job seekers can follow these tips and get benefited with LinkedIn.